When we were living in Malaysia, we used to buy some of the Malay kuih-kuih from the roadside vendors and we always enjoyed them with a cup of coffee/tea for our afternoon snack. What a life! Can you imagine this: 3 pieces of kuih for RM1.00 only!!! As most kuih are sweet, I have reduced the quantity of the sugar and yet it is still very palatable. If you are like me who enjoy desserts made of tapioca and coconut this is one of those that you should make for a tea time snack or have it for after lunch/dinner dessert. If you enjoy our recipes and they are helpful to you, we love to hear from you so once you have tried this recipe, we hope that you could provide us with some feedback/comments either via our blog or by joining our Mummy’s Kitchen Facebook Group. 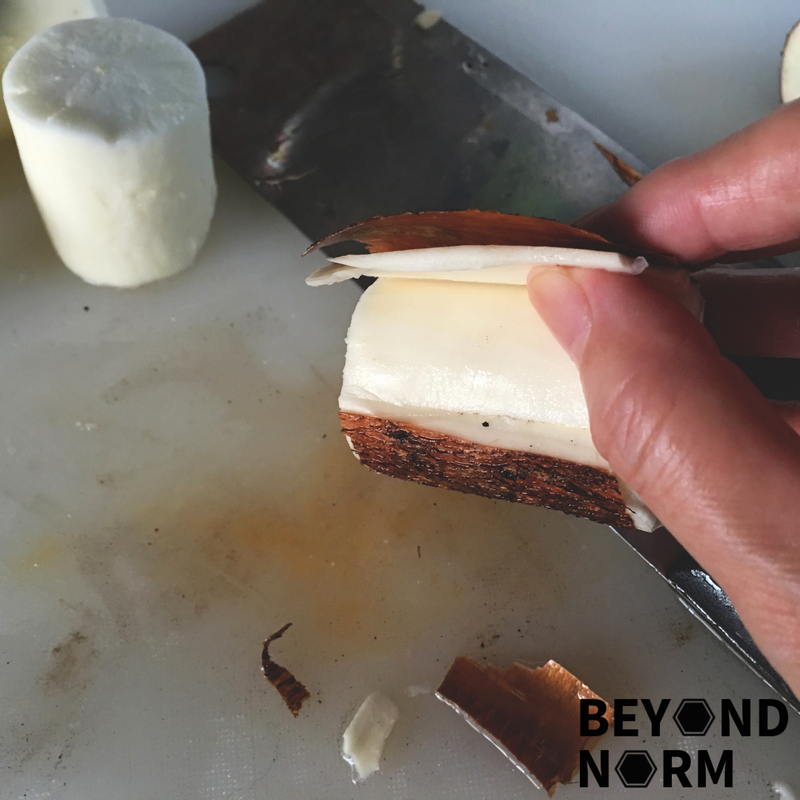 You can like us on Beyond Norm’s Facebook Page or subscribe to our blog via the right side bar to get the latest updates. Line 23 x 5 cm square cake tin with banana leaf or parchment paper. Preheat oven to 170°C. 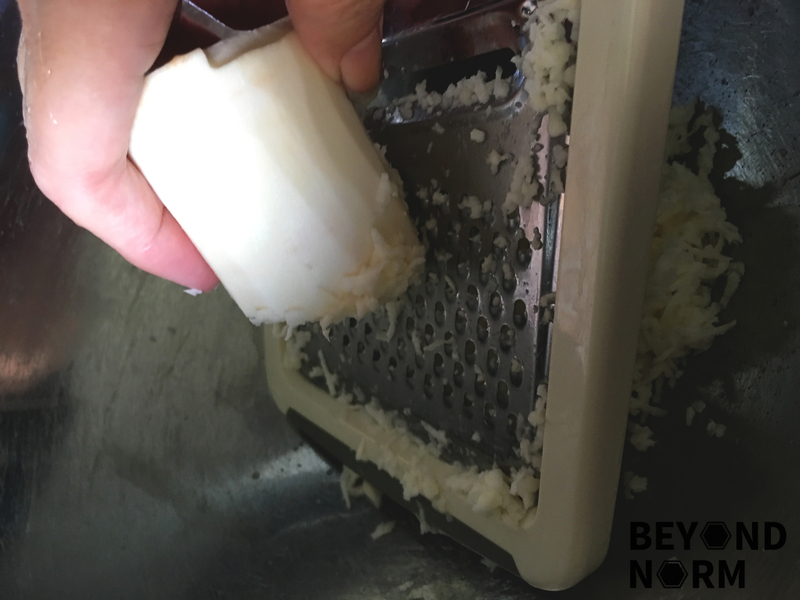 Rinse the cassava/tapioca to remove any debris. Cut a shallow slit along the length of the skin and proceed to peel it off. It should come off quite easily. Rinse off any debris after peeling off the skin. 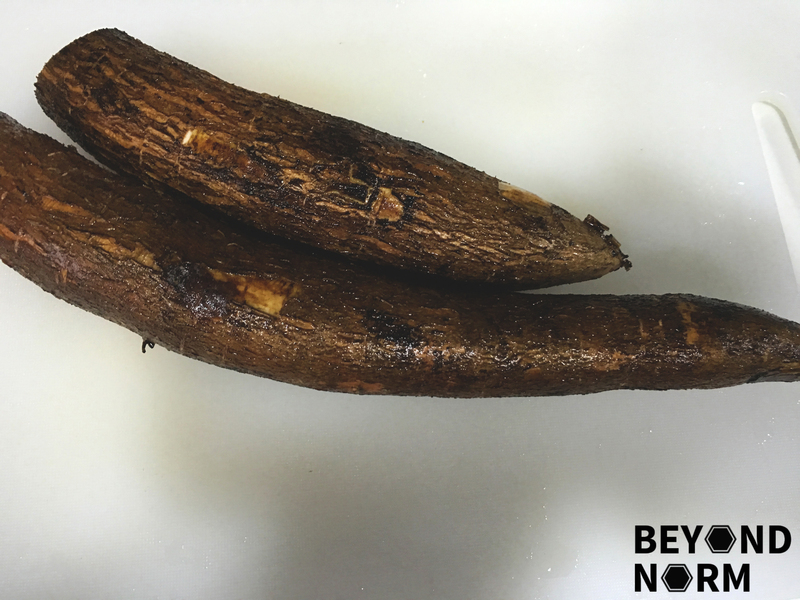 Grate the cassava/tapioca and make sure you discard the tough fibre that runs along the length of the tuber. 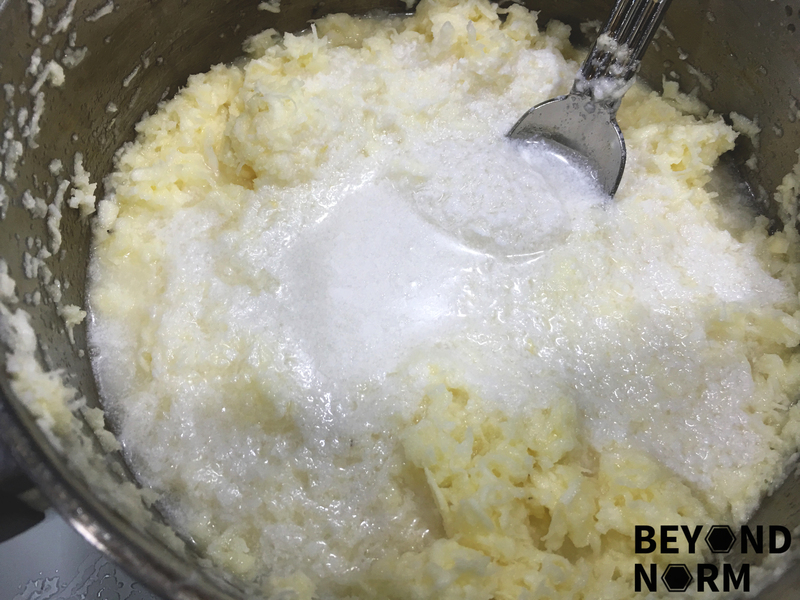 Combine grated cassava/tapioca, egg, sugar, coconut milk and salt into a mixing bowl. Mix thoroughly to combine everything together. Add in the grated coconut and combine well. Pour the mixture into a baking tin lined with banana leaf or parchment paper. Bake in the oven for about 1 hour and 30 minutes. 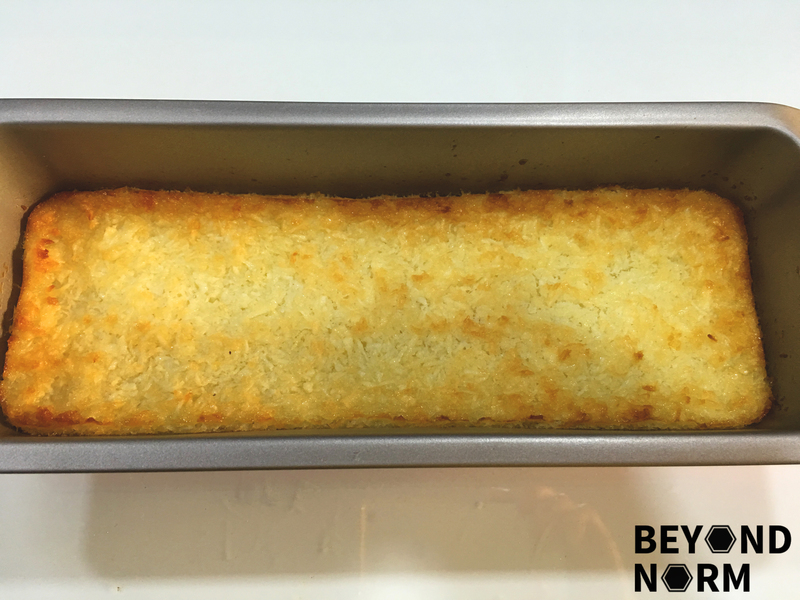 If you like, after the baking is done, turn up the oven heat dial to 220-225°C to allow the top surface to brown a bit more. 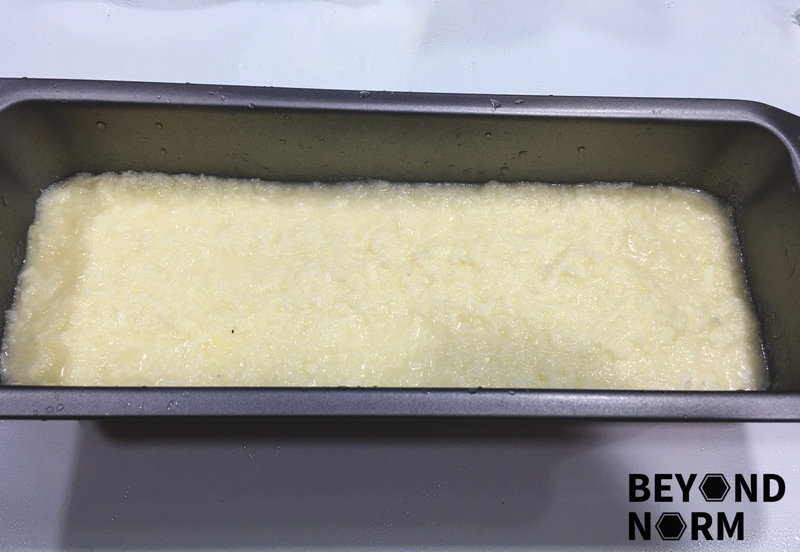 Watch the kueh closely and remove it from the oven once the surface has attained the desired browning effect. Leave to cool completely before cutting and serving. Cover the rest of the leftover kuih. It can be kept in the refrigerator for 2 to 3 days. Love your recipes because the step by step instructions is very in details for those like me who doesn’t know how to cook. Thank you for sharing and have a nice day.